Who Wants To Be A Millionaire has arrived at Slots Gold. The popular TV quiz show has been relaunched recently with Jeremy Clarkson. Contestants have to answer questions to increase their prize money. Answer all 15 correctly and they become a millionaire. 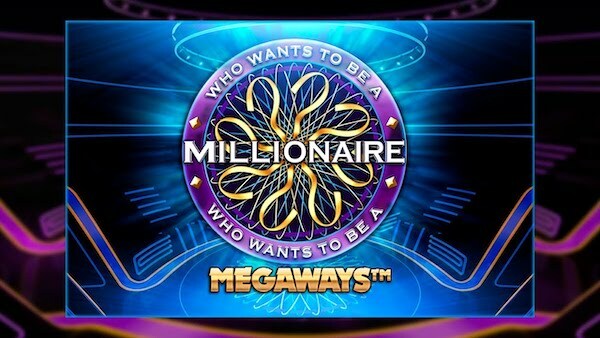 Clarkson and his questioning are thankfully no where to be seen on this megaways slots version from Big Time Game that offers up to 117,649 ways to win. Big Time Gaming have managed to encapsulate the atmosphere of WWTBAM. The look and design of the slot plus the signature music leaves you in no doubt that this game is related to the TV show. The slot itself is played on a 6 reel grid with an extra line under reels 2, 3, 4, and 5. There are multiple win lines (megaways) on each spin and these are revealed on the slot. The base game features gems as the main symbols with card icons of 9, 10, K, Q, K and A making up the rest of the roster. The purple diamond is the highest paying symbol at x50 for a row of 6. However with Megaways these wins can become a much bigger. Every winning symbol on a spin is removed from the reel after a win - known as a reactive win - therefore offering more chances to win with a cluster fall mechanic. The WWTBAM experience kicks in through the slots features. Get three WWTBAM symbols on the reels to activate 8 free spins and the Hot Seat Free Spins Gamble. You don't have to take the gamble but if you opt-in then you can win up to 50 free spins by answering 12 questions correctly. To gamble you need to answer A, B, C or D and then press "Final Answer". Three lifelines, phone a friend, 50/50 and Ask The Audience assist you on the quest. During the free spins any wins activate a multiplier. This increases with every reaction up to an unlimited level. Also during free spins any scatter symbols - which will only appear in the extra reel - will result in additional spins. 3 scatters equals four spins and four scatters means five extra free spins. There's so much to like about this slot. From the clever design to the Megaways through to the innovative feature round and the clever use of music from the actual show. For example when two scatters are on the reels the "heart beat" soundbite kicks in to add tension. Who Wants To Be A Millionaire can be played on mobile, tablet and desktop. Login to Slots Gold and try it for yourself.